How Can Biometrics Help Ending Corruption in the Government Sector? Democracy is considered to be the most successful system of forming and running the government, in which each citizen can have his/her say. Despite that, it suffers from many shortcomings and corruption is one of them. Corruption can have a significant impact on distribution of resources and services which are facilitated by the government. It hinders government’s objectives and makes people suffer. Superficially, corruption may not look like a big problem, however, when it is spread in the entire system, it has ability to hold back the progress of a nation. Let’s dig little deeper how and where corruption may creep in the government facilitated distribution of goods, services and resources and how biometrics can help eliminating it. 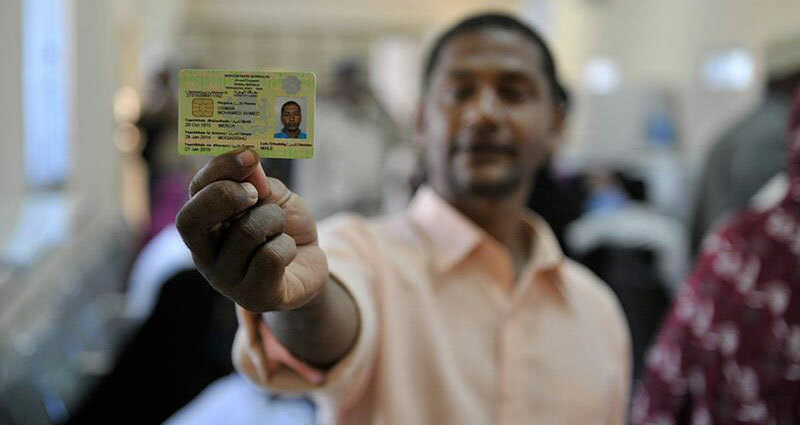 Image: A Nigerian citizen showing National Electronic Identity Card (e-ID) which can be used as electronic ID, EVM payments, on-card fingerprint identity verification and many more functions. What is corruption and why does it happen? Fraudulent, illegal and immoral gain out of one’s position and authority in an organization (government or non-government) is called corruption. Fraud, bribery, embezzlement, favouritism, etc. are some of the forms of corruption. One of the commonly seen forms of corruption is bribery. For example, when a public service officer wants bribe to do his/her duties, which he/she is already being paid for, is corruption. Corruption can be a widespread problem in a government system, specially in the third world economies. When the idea of personal benefits takes over the minds of government officials, who should rather be working to benefit the organization or the people instead, the chain reaction of corruption begins. It may become out of control and corrupt the entire system when more and more people get involved. In its serious form, corruption can drastically impact distribution of government resources and public services. It not only takes a significant toll on government funds but also hit the objectives of the country. Flawed distribution of government resources and corruption can be more evident in third world countries. In many developing and under-developed economies, corruption eats a substantial portion of public money. In its severe form, corruption can spread among the policy makers, who may choose personal benefits over the progress of the nation. Corruption alone can hinder the growth of a country. Millions of dollars are budgeted by developed nations as foreign aid to help under-developed and developing countries, however, a significant portion of this money can be consumed by the corrupt system. Corruption in government sector and in public services distribution is more apparent in third world countries because the distribution system suffers from loopholes like poor control, manual management of target population, depending on traditional identification methods, etc. How Biometrics can help ending corruption? In recent years, biometrics has been widely deployed in government projects and for large scale identification like biometric civil ID. In many countries, capturing biometric data has been mandated for civil identification. Some countries have also introduced national ID cards, which hold biometric identifiers like fingerprints in a chip. Many countries (even the developed ones) do not have the concept of a separate national ID and documents like passport or driver’s licence are used for the purpose. Since these documents follow all the procedures and checks required for a civil/national ID, government may not feel requirement of a separate ID in the name of national ID. The United States is one of the countries in which there is no separate national or civil ID. Your passport or driver’s licence can do the job. Though use of other IDs as the national ID is not a bad idea, but a dedicated ID can be more useful and let citizen access all government services with one ID. It has to be robust and should be equipped with modern identification approaches like biometrics. Biometrics as a government issued identity can patch many loopholes present in traditional card or document based identities. Efforts to leverage biometric identifiers for civil identification are already underway in many countries and some of them have already deployed biometric based national ID. A biometric based identity can be used to access many services facilitated by the government. In third world countries, government services are usually found to be full of red tapes and identification formalities consume a lot of time and make the whole process sluggish. Biometrics based identity verification will not only expedite the delivery of government resources but also eliminate the possibility of corruption by identity manipulation. Money, goods, services or other resources that is provided from one country to another is called foreign aid. This transfer often takes place from rich or developed countries to poor or developing nations. Military, economic and emergency humanitarian assistance (e.g. after an earthquake, flood, etc.) from one country to another is also called foreign or international aid. Transfer of aid can attract corrupt intentions, especially when money is involved. Stuffing database of target population of foreign aid with fake names or identities is a common method leveraged by corrupt officials. The resources are issued to these fake names, which end up to the corrupt system. Biometric identification of beneficiaries of foreign aid can potentially solve this problem. Social welfare programs run by the government can be the potential target of fraud and corruption. Since these programs target a large population, they often have huge funds involved which can be vulnerable at various levels if not managed properly. Corrupt officials may devise ways to leak funds on the name of fake beneficiaries, which eventually get to their own pockets. Many social welfare programs are designed to help poor and deprived group of individuals like old age people, illiterate children, financially weak families, etc. However, it has been experienced that fund released for these welfare programs are not fully utilized in the program and some corrupt officials find ways to leak money out of the welfare fund. This is usually done by adding fake names in this list of individuals eligible to receive welfare benefits. Exaggerating cost of services of goods supplied or used, hiring or purchasing substandard resources yet showing the price high in records, etc. are some of the other methods leveraged for welfare corruption. Introducing sham identities and releasing funds in the name of people, who only exists in this corrupt system but not in reality, can claim a significant chunk of social welfare fund. Biometric identification can solve this problem and make sure that only eligible and real people are provided the welfare benefits. With biometrics, it becomes impossible to commit welfare fraud and corruption is significantly subsidized. When any government (or the non-government) authority controls the distribution of certain resources, goods or services, it is called rationing. These goods or services are usually those which are important but short supplied or have very limited availability. Rationing makes sure that all eligible individuals get their fair share as defined by the rationing authority. In many countries, government also ration food and other items on subsidized prices for deprived individuals. Responsibility of rationing can be handed over to a government or a private authority and that is where corruption may creep in. There have been several incidents in which authorities involved in rationing were found selling controlled goods in black market. Sometimes when quantity of controlled material is large and not all individuals show up to claim their quota, corrupt rationing officials sell the remaining quantities in the black market and show consumption in the name of eligible population. Rationing of goods, services or any other resource is achieved by issuing a ration book or ration stamps to eligible individuals. A ration book holder has to show up at a predefined place to get their ration. The ration book has all the entries of previous issuance of ration, similar entries are also done at the rationing authority’s end. On an entirely manual system, these entries are done by hand in a register. These registers are later used to calculate consumed quota and remaining quantity. Corrupt rationing authorities circumvent the system using fake entries of the eligible individuals and black market the remaining quantities. This activity eats the government spending and if a country is already struggling to keep up, it leaves a huge impact. Biometric identification of individuals eligible for ration can eliminate all possible loopholes from the system. Biometrically authenticated records will make sure that only eligible individuals can claim their ration quota. It will save significant government spending and resources that go to the pockets of corrupt officials. Government subsidies or incentives play an important role in promoting economic and social policies. Government subsidies and rebates may be provided directly as money or it may be indirect like tax rebates. When subsidies involve direct transfer of money, it gives a chance to corrupt officials to introduce fake identities in the database and release funds in their name. It can take a huge toll on government funds and policies to support an economic sector and the subsidy related corruption hinders the growth of the sector. Government subsidy related corruption can also be eliminated using biometric identification of beneficiaries. The government of India, for example, transfer subsidies directly to the bank accounts of individuals, who have verified their identities biometrically. In any country, common people greatly depend on government facilitated services; however, gaining access to these services may not be straightforward. People often have to go through a lot of identity verification red tapes, which can be a time consuming and frustrating process. Corrupt system in third world countries tend to make simple things complicated and then ask for bride to make them simple again. For example, in third world countries like India and Pakistan, a simple task of making driving licence can be more complex than learning to drive itself. Officials will look uninterested if you directly approach them and accepting your form may take more than one attempts. Every time they will point out an error and ask you to refill. They will make this simple task look so complex that you will have to hire an agent, who will charge you double, even triple of the original cost of making the driving licence. This money also goes to the pockets of transport authority officials, that is why agents look so efficient. This is almost the same story in all government departments, be it transport authority, municipal office, departments responsible for maintaining public facilities, etc. Biometrics can save a lot of identification hassles and ease the access to the government services. Government services should reach the last mile, so should the technology that facilitates those services. However, deployment of biometric recognition can be a challenging task in third world countries. Even in 21st century, many of these countries suffer from basic connectivity problems. There may be areas where there is no internet, phone and even electricity. Target population may not be comfortable with the new system if they do not understand it. Local storage of biometric and inventory data in mobile verification units can be a potential solution. Transparency in government organized projects and welfare schemes have always been a problem. Lack of transparency gives corrupt officials a chance to manipulate the system for personal benefits. Leaking money out of government funds, subsidies, foreign aid, social welfare schemes, etc. has been a common target for corruption and fraudulent manipulation. Corruption can be more evident in third world countries, fragile states and under developed economies, where there is a poor control on government officials responsible for distribution of goods and services. Biometric identification can ensure efficient and corruption free delivery of government services and resources.